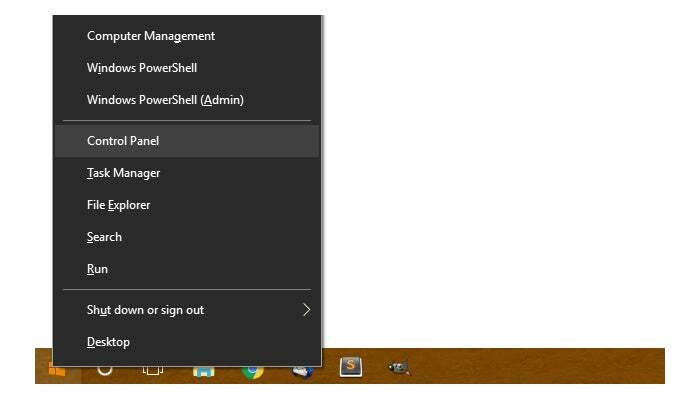 If Microsoft removed the Control Panel option from your WinX menu, here's how to get it back. Prior to the Creators Update rollout last month, I did a refresh of my Windows installation to shake out a few nagging problems. After the refresh, I noticed that Microsoft did me the very unhelpful favor of removing the Control Panel in the WinX power user menu that appears when you right-click Start or tap the Windows key + X keyboard shortcut. The Control Panel was replaced, of course, with the Settings app. I understand that Microsoft is slowly moving the Control Panel's functionality over to Settings. Even so, the Control Panel is still very necessary, and I'd much rather have it in the WinX menu than Settings right now. Here's how to switch back. First, you need a Control Panel shortcut. Instead of creating your own, download a pre-made shortcut from German-language blog Deskmodder.de (ZIP). Unzip the folder and put the Control Panel link on your desktop. That ain't the Control Panel! Now, open File Explorer by tapping Windows key + E, then click on the address bar. Enter %LOCALAPPDATA%\Microsoft\Windows\WinX\Group2, and now hit Enter. Notice that the Settings app shortcut is called Control Panel in this folder. Before we can bring the real Control Panel back, we'll have to get rid of the current Control Panel shortcut. First, however, let's back up all the shortcuts in this folder in case something goes wrong. All you have to do is copy and paste the shortcuts into a new folder on your desktop. Call the folder whatever you like, but "WinX Backups" or something similar is probably a good idea. The Control Panel is back and ready for business. Once that's done, return to File Explorer and delete the current Control Panel shortcut. 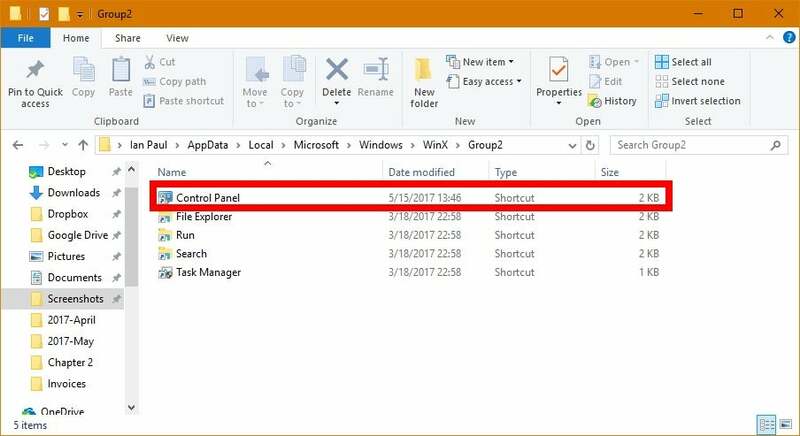 Drag-and-drop the new shortcut from the desktop into the WinX folder. The new setup should look similar to what's pictured here. Restart Windows Explorer to see your WinX changes. Now let's see if it works. Close all File Explorer windows, right-click anywhere on the taskbar and select Task Manager from the context menu. With Task Manager open scroll down to the bottom of the Processes tab, click on Windows Explorer and then click Restart. Your taskbar will disappear for a second as Explorer restarts. Next, right-click the Start menu or tap Windows key + X, and Control Panel should be in the WinX menu.